Baby shoe styles range from basic booties to miniature versions of adult shoes, but the shoes with a soft, flexible sole are often best for your baby's feet. These shoes have thin soles with nonskid bottoms and typically come in sizes from newborn to toddlers. The amount of growth and development of a baby's foot requires proper footwear such as soft sole shoes. Soft-soled baby shoes offer a comfortable footwear option for babies because they aren't hard and rigid like traditional shoes. In addition to the soft soles, the upper portion of the shoes are made from soft, flexible material. The shoes are wide and spacious in the toe area, unlike some hard-soled shoes that have narrow designs and tight toe areas. If you want to put shoes on your baby, the soft-soled shoes allow your infant to stretch and move his feet around for greater comfort. Barefoot walking allows your baby's feet to grip the floor and helps him balance, but potentially dangerous surfaces require the use of shoes. Even with the soft, thin soles, the baby shoes protect your baby's feet from rough or slippery surfaces, objects on the floor or cold temperatures. The American Academy of Pediatrics recommends a pair of shoes with nonskid, flexible soles once your baby starts walking outside where more potential dangers such as sharp objects exist. Shoes on a walking baby also keep his feet clean. Hard, restrictive shoes might affect foot development in babies. Some parents feel hard, supportive shoes increase a baby's ankle strength, but according to Dr. Elizabeth Berger in "Parents" magazine, no evidence exists that shoes strengthen the ankles. All of the wiggling, kicking and other movements your baby does with his feet help him develop the foot muscles that he needs for walking. Tight, hard-soled shoes limit the amount of movement in your child's feet. Soft-soled shoes with plenty of space in them allow your baby to move his feet to avoid interruptions in development. Traditional shoes with hard soles are heavy and might make it more difficult for your baby to lift them and walk. 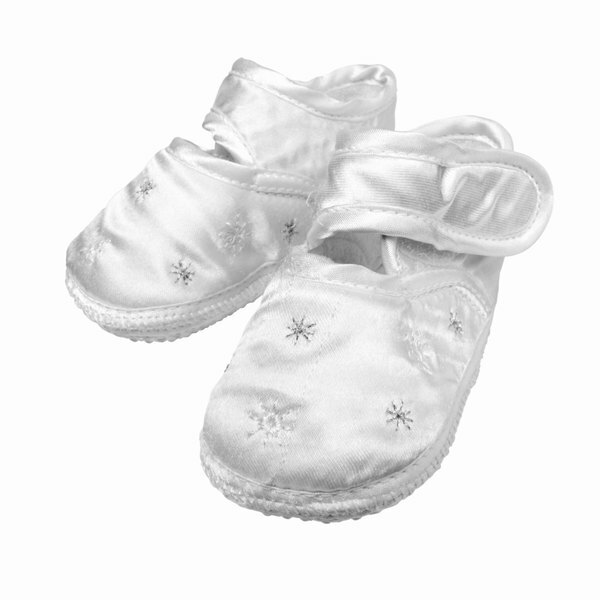 Soft-soled baby shoes are lightweight for less affect on his ability to walk. The thin soles allow your baby's toes to grip the floor as he would if he went barefoot, making it easier for him to walk. Soft-sole shoes might also help him better develop his sense of balance and coordination. Parents: Should Babies Wear Shoes When They Begin to Walk?